UCSA Events Centre - Acoustic Engineering Services provides measurement, design advice, and expert evidence in the field of acoustics and noise control. The new home of the iconic Foundary and Bentleys bars at the University of Canterbury underwent an accelerated Consenting process. Student facilities at the University of Canterbury were significantly affected by the 2010 / 2011 earthquakes. The ‘Student Union’ building which housed the Ballroom, Ngaio Marsh Theatre and a number of bars was amongst the buildings which could no longer be used. A fast tracked, lightweight, temporary building (10 years) was proposed as a replacement, designed by Warren and Mahoney Architects; however, a Resource Consent for the project was needed before work could get underway. 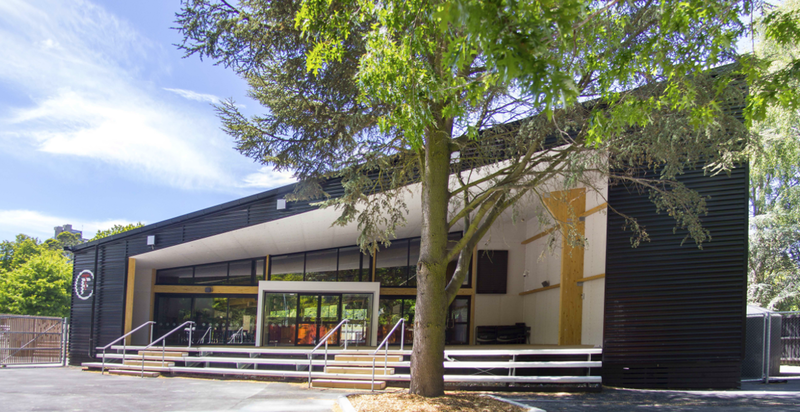 In order to limit noise exposure to the neighbours, AES were involved from an early stage to help determine the best location for the building on the extensive campus site. Jeremy Trevathan explains – “While it was a lightweight structure, it was going to be home to some very high levels of noise. The arrangement and layout of the building were critical to helping to contain the noise. All doors and windows open inwards toward the campus and we used sound lobbies to isolate noise when people were entering and leaving the performance space. Inside the building acoustic absorption treatments more commonly used in industrial applications were employed to create an internal environment suitable for a wide range of uses”. The location eventually selected was in close proximity to a shared boundary with a primary school. Through the use of noise contour images, and by providing straight forward explanations, AES were able to assist the School and University in reaching agreement as to how the situation should be managed. Through liaising with Council noise experts, AES then also helped ensure the consenting process went as smoothly as possible, with the Consent processed on a non-notified basis. Open by April 2012, the UCSA Events Centre is now playing a key role in maintaining and enhancing vibrant student life on campus.